Entering service at the end of the Battle of Britain, the pugnacious Bristol Beaufighter was deployed in numbers by Fighter Command just in time for the start of the Luftwaffe’s night ‘Blitz’ on Britain. Flown by specialized night fighter squadrons – several of them elite pre-war Auxiliary Air Force units – it was the first night fighter to be equipped with an airborne radar as standard. Thus equipped, it combined the ability to ‘see’ the enemy at night with the devastating hitting power of four cannon and six machine guns. 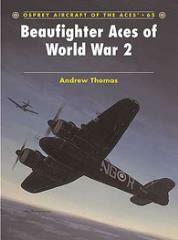 This book covers the exploits of the men who made ace in the Beaufighter and includes stunning original artwork together with first hand accounts of the action.